Misr International University was pleased to host Dr Ebtesam Ahmad, Clinical Associate Professor at St. John’s University, as visiting professor from the 20th of November to the 4th of December, 2015. Dr. Ahmed, also Pharm.D, M.S. 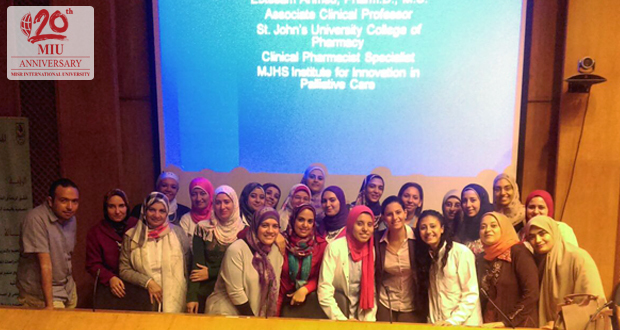 at St. John’s University College of Pharmacy and Health Sciences and Clinical Pharmacist Specialist at MJHS Institute for Innovation in Palliative Care, shared her expertise in two pharmaceutical workshops during her visit. Dr Ebtesam also presented a session in the 9th Continuing Education workshop of the Faculty of Pharmacy that was held on the 26th of November, titled “Palliative Care in Critical Illness.” Moreover, she contributed to teaching senior pharmacy students’ topics on Palliative Care, Pain Management and Hepatitis C.